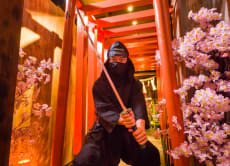 Interactive Karakuri Yashiki (a house of tricks) opened in Kabuki-cho, Shinjuku! What you can do in the House: Using Japanese sword/ninja sword. Finding secrets in the ninja house.